IF YOU LIKE MAJORCA, WHY NOT TRY…? Magaluf is Majorca's undisputed party magnet with Bar Street, booze cruises galore and the amazing BCM Square and club. The white sand Blue Flag beach is lovely for the day after the night before, too! But why not reboot your party vibe in lively Ayia Napa? This resort on the island of Cyprus is the go-to hotspot for cool clubbers and bar-hoppers. You’ve got a waterpark, watersports, sea caves and the gorgeous Cape Greco National Park to keep you busy during the daytime and Ayia Napa also has Nissi Beach, a Blue Flag beauty nearby. This white sandy stretch has been described as one of the best beaches in the world and has just one of the 14 Blue Flags flying in the area – so there’s no reason why a party holiday in the sun has to mean a poor effort when it comes to sand and sea. Take a look at our Ayia Napa holiday deals and secure your sunshine holiday today! Lots of families love Majorca for its fun attractions and child-friendly resorts such as Palma Nova. The brilliant beach and seafront promenade lined with little-one-friendly restaurants and bars make this a great resort for those with kids who don’t want anywhere too sleepy. You’ve also got fun attractions, including a go-kart track, waterpark, Golf Fantasia and the Katmandu themepark nearby, to keep any cries of "I’m bored!" at bay. If you fancy changing it up a little, Tenerife is another top spot for families. This Canary Island boasts sunshine all year round and its a perfect place for winter sun or early summer getaways. Los Cristianos and Costa Adeje are some of the most popular resorts for families - both being just the right side of lively, without tipping over into 18-30s territory. The Loro Parque animal park and Siam Park waterpark are the two biggest attractions on the island for kids, while jeep safari trips up Mount Teide, boat trips to La Gomera island and horse riding treks also make great days out that all ages will enjoy! Palma de Mallorca is one of those rare destinations that manages to combine city and coast perfectly. Beyond the beach and the harbour of Palma, you’ve got tons of history and culture, including the capital city’s famous La Seu cathedral, an atmospheric old town, museums, shopping and restaurants. If you’ve been there, done that and got the fridge magnet, why not browse our Barcelona holidays instead? This Spanish city has even better beaches, with 4km of city centre sands at Barceloneta beach, compared to Palma’s teeny 200 metres. Other city highlights include the magical architecture of Antoni Gaudi, with the twisted spire Sagrada Familia cathedral being just one must see building, plus the vast city park Ciutadella, the lively central Las Ramblas avenue, the labyrinth that is the gothic quarter and lots of big name Spanish boutiques and shops to browse in. Kids will love the zoo and the aquarium, while adults will be spoilt for choice with the restaurants, bars and clubs that keep the city buzzing from dusk till dawn. If you want to find out more about our favourite beach and city break, take a look at our advice for travelling to Barcelona. Majorca's Cala d’Or draws holidaymakers looking for a more relaxed pace of holiday, and its line up of seven stunning coastal coves means you can take your pick of places to lay that beach towel. There’s a swish marina complete with restaurants and bars overlooking the superyachts, plus great golf courses. For a similar vibe, Albufeira is one of Portugal’s most popular Algarve holidays and boasts an impressive 25 beaches, so you’ll never struggle to find a secluded sandy spot. The pretty marina with its candy coloured buildings is at the heart of the action in Albufeira with lively bars. Mix in lots of family-friendly establishments, plus popular Algarve attractions like Zoo Marine and Aqualand, and you’ve got a sunny holiday destination that’s hard to beat. Take a look at our top 8 things to do in the Algarve for plenty more fun in the sun. 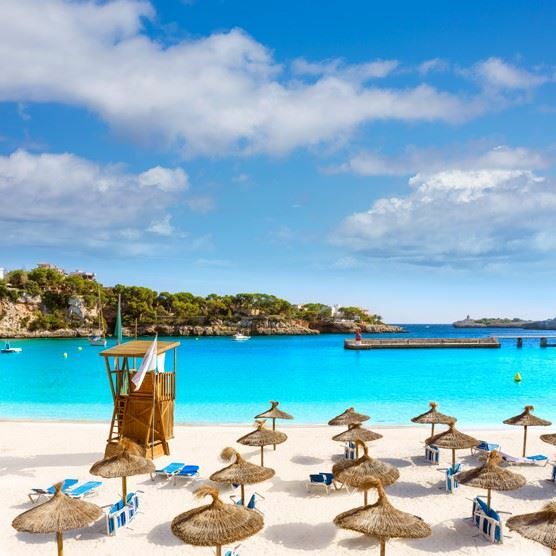 Majorca's Alcudia has got all the features of a brilliant holiday resort – lively nightlife on Dollar Street, a Blue Flag beach with watersports, a swanky marina with places to eat, drink and shop, and a nearby nature reserve to hike and explore. Go through the gateway to the medieval old town and get lost on a journey back in time with Roman ruins, a pretty church and plenty of authentic Spanish hole-in-the wall restaurants to stop at for tapas - plus you can walk the top of the old town walls for great views. Malta holidays are another Mediterranean hotspot for history, with its beautiful waterside capital Valletta boasting breathtaking palaces, mansions and medieval ruins – the Fort St Angelo, Grand Master’s Palace, St John’s Co-Cathedral and the ruins of the Royal Opera House are all ones to put on your must see list. Discover Malta's old capital, Mdina, known as the Fortress City, the Noble City or the Silent City. You’ll be whisked back 4000 years in time as you explore within the ancient city walls, with beautiful baroque and medieval architecture at every turn. Don’t miss the Citadel (old city), the Cathedral of St Paul or the Palazzo Falson Historic House Museum. Once you've soaked up the history, head out to sea and discover the gorgeous Crystal Lagoon by boat. Majorca is a mega holiday destination with loads on offer across the island, but there are plenty of equally brilliant alternatives to choose from, too. If you fancy somewhere a little different this year, or you prefer to stick to what you know, take a look at our cheap 2017 holiday deals and get ready to check-in. Whether it’s a party, beach or family fun that you’re after, we’ve got the lot.